Pets going to pet heaven is inevitable. 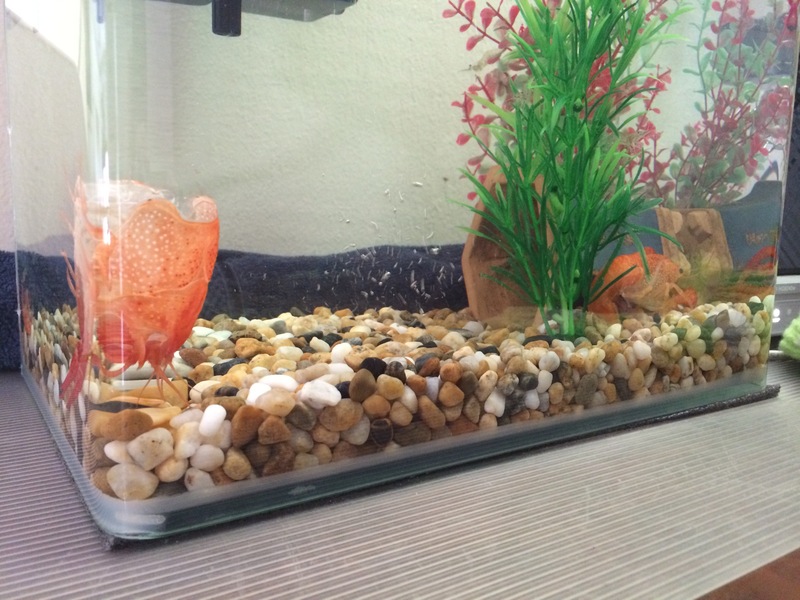 The fishes that we had in the little aquarium came and went pretty fast and we never felt anything. 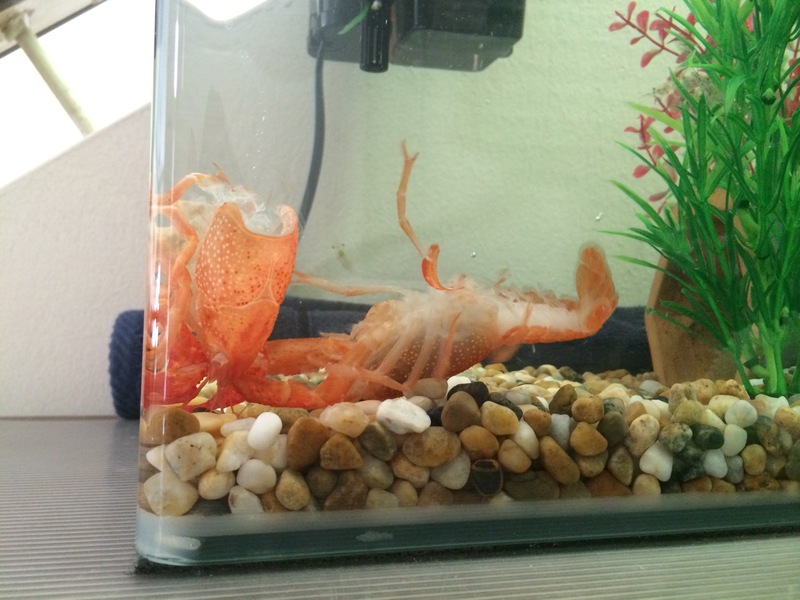 But when the same fate happened to Luna so soon, our pet crayfish, we felt sadness and an emptiness never before. I guess it never crossed our minds that she will go so soon and rather tragically. There was definitely a bond with Luna, compared to the Bettas. She had character and was interesting. And definitely a delight to observe. 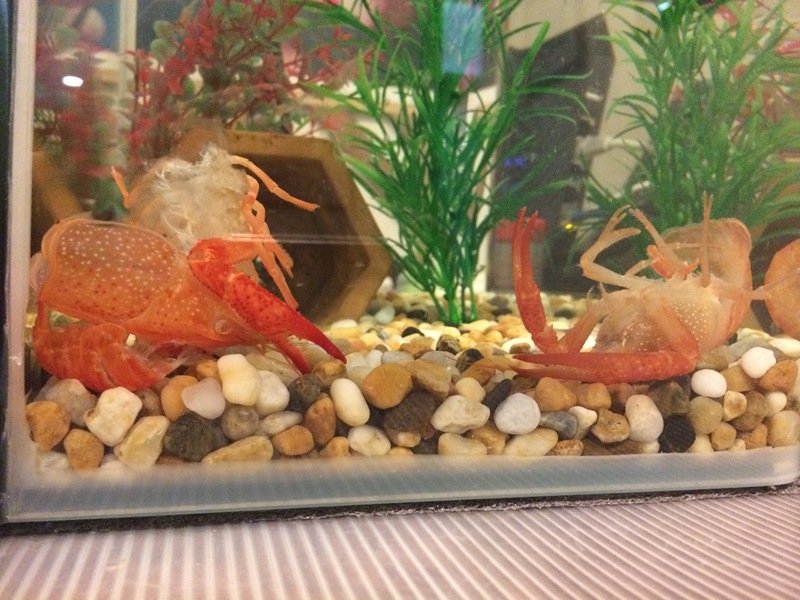 The last time we had some crustacean pets was when the girls were younger. They had some hermit crabs and we even had a hermit crab abode for them, a crabarium instead of an aquarium. Now those critters had character too, and were fun and silly. But all had gone to let heaven. Our pet heaven is pretty crowded. There’s Luna now, along with all the Bettas, the hermit crabs, some koi and parrot fishes, a couple of Indian Star tortoises, a terrapin and hamsters. I hope there won’t be any addition for now. It was a typical Sunday morning but there was excitement as far as Luna was concerned. She was molting! The old shell was just floating and she was still wiggling. But we thought the deed was not completed as she’s acting really weird and hiding in her cave. A little bit more to shed and a bigger Luna would emerge? We were careful to be discreet so that she won’t be spooked. Luna was buried in the garden this morning. 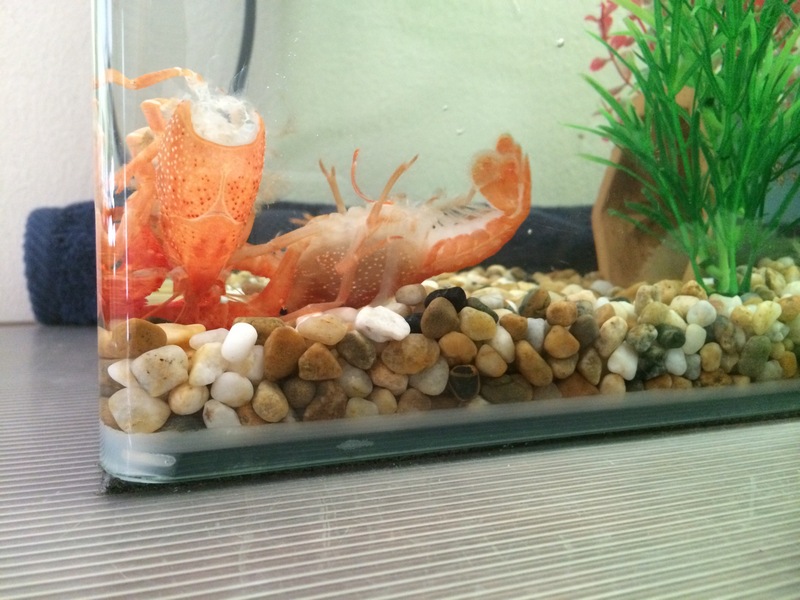 I think Silly Prawn became food because I can’t seem to find it in the aquarium. It must have become food because Luna was out from her cave two days’ ago and being silly, striking a pose of wanting to scale the aquarium height. Was Silly Prawn terrorizing her? This morning, I spotted another silly prawn hoovering over an upside down one. Can’t be Silly Prawn, can it? And looks Silly Prawn II is in the making because Luna is back in her cave! Between the crustaceans, visiting birds and official pet number one, life amidst them creatures sure is entertaining. Save me from Silly Prawn! This year’s Thanksgiving somehow made me recall the one we celebrated four year’s ago in the most coordinated fashion. It may be one celebration that we don’t do often but when in America, we have to do what the Americans do! And it was by far, the best Thanksgiving ever. 2012 was the year of our Great Adventure Road Trip in the US. And it was the year my niece and nephew – the twins, were studying in Kentucky. And I thought it would be fantastic for them to fly out to California to meet up with us. And their sibling – my niece, K1 can join us too, flying in from KL since she was old enough to travel by herself. And we would all spend Thanksgiving at the happiest place on earth, Disneyland. It took me more than a year to plan for our impending trip because there were so many stops, friends, activities and lodging to consider. And this extra family get-together time in California needed more attention because the three parties were coming in from three different locations. Very exciting that it culminated with good timing and no delays. During the Thanksgiving week, we were just wrapping up the Las Vegas stop. By Tuesday, we left for LAX to pick up K1 who was flying in alone from Kuala Lumpur. 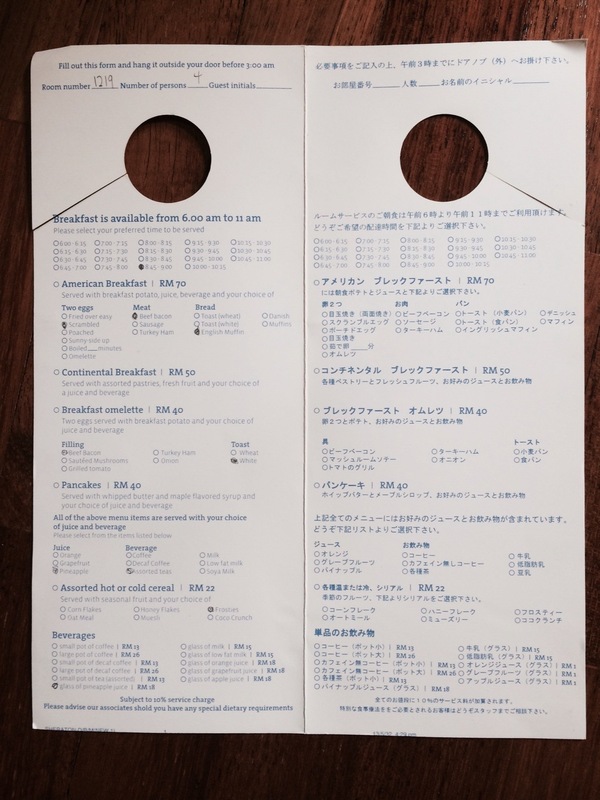 The great mastermind–me–had planned for her to arrive that afternoon and estimated that she would come out to the Arrival Hall by 1.00pm and we can just pick her up curbside if we started our journey at 9.00am. The timing had to be perfect and it was. When we got her, the poor child was so zombied after the 18-hour plus journey whilst we were still fresh from our pleasant unhurried drive. We tried our best to keep her awake to adjust her to the new time zone. It wasn’t easy. 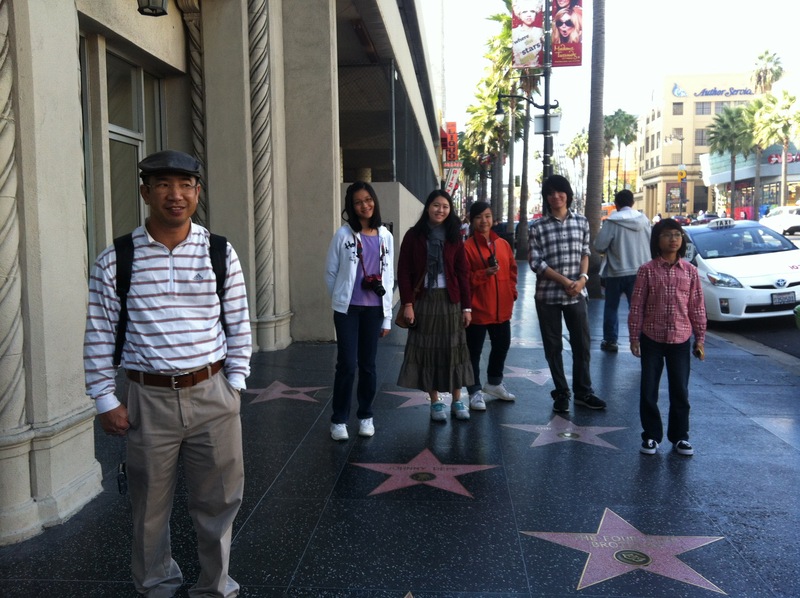 We played tourist and visited downtown Los Angeles for a day excursion to see all the famed attractions. Then by late evening, we made our way to Anaheim. It was to be our base for the next few days. On Thanksgiving morning, we were off to Disneyland and had the most memorable American Thanksgiving. The seven of us had the best times of our lives with all the rides, sights, food and fun. 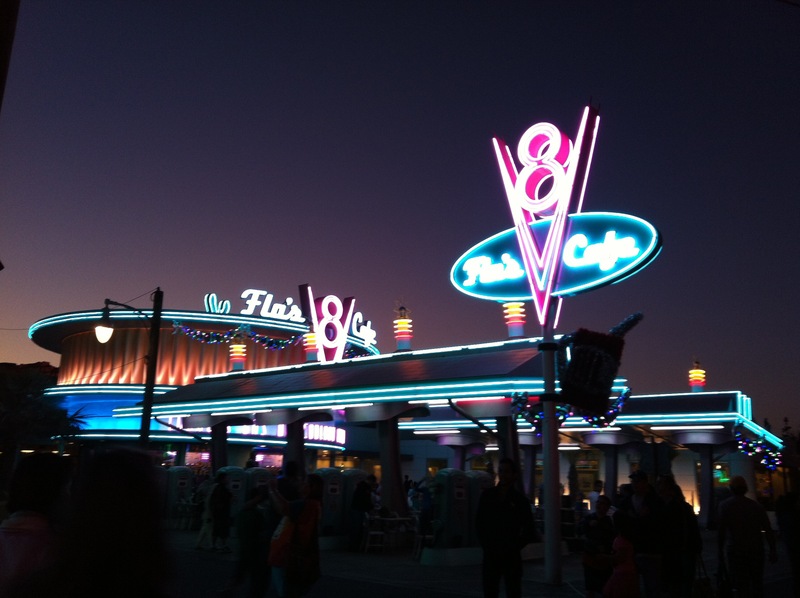 And although dinner was just a simple meal at Flo’s V8 Cafe, what mattered was the experience and time spent together. The crowd was relatively small, yet there were still long queues for the more popular rides and we took it all in stride. The Disney experience continued the next day at the main park and Universal Studios the following day. By Sunday, the Thanksgiving break was over and the twins headed back to Kentucky with K1, while we stayed on in Anaheim for three more days before heading north to San Francisco via the Pacific Coast Highway. After that awesome Thanksgiving experience, our Road Trip continued and all other Thanksgiving was never the same again for us. 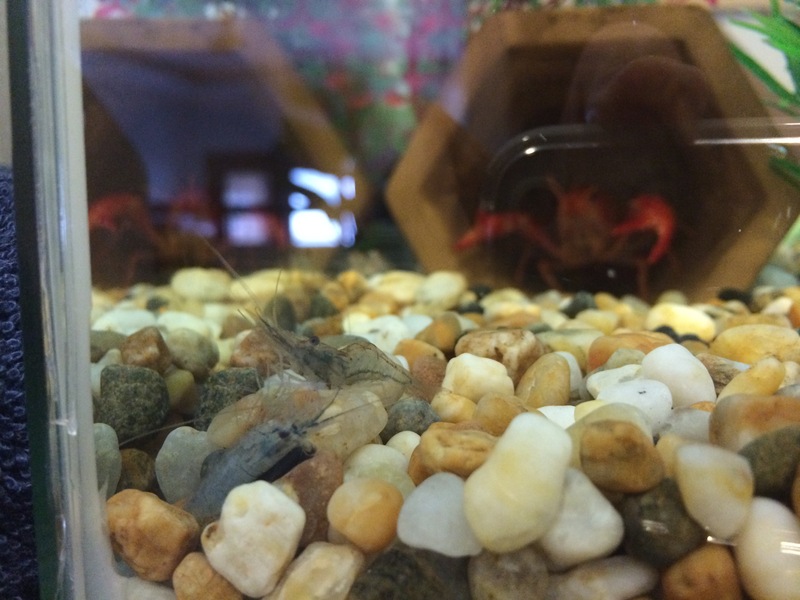 Our latest pet, Luna the crayfish has been a delight for us. But it is still very shy. 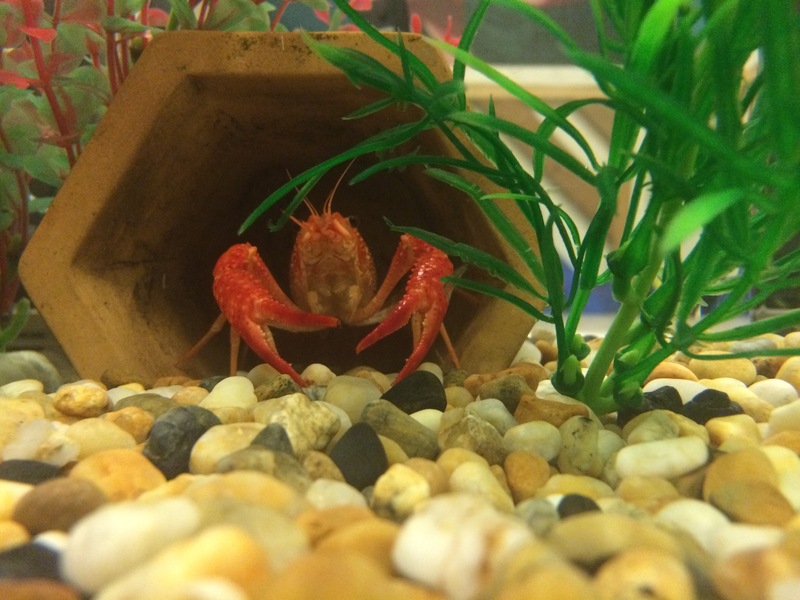 From the internet we learnt that crayfishes need something to hide in or under. So hubby put a mini flower pot in the little aquarium to double up as its hiding place because we didn’t have time to get a driftwood for her. And it’s worked out well. Luna has even mastered the art of manoeuvring into her homely cave skilfully every time she needs to chill in there by moving backwards into it; call it a reverse park if you may. So efficient and practical. Sometimes if we accidentally spooked her, she would reverse further in and plaster herself, back in, to the back of the pot and raise her claws as if in defense. We think this fascinating Kung fu posture is unlikely if it was a driftwood instead of the pot. 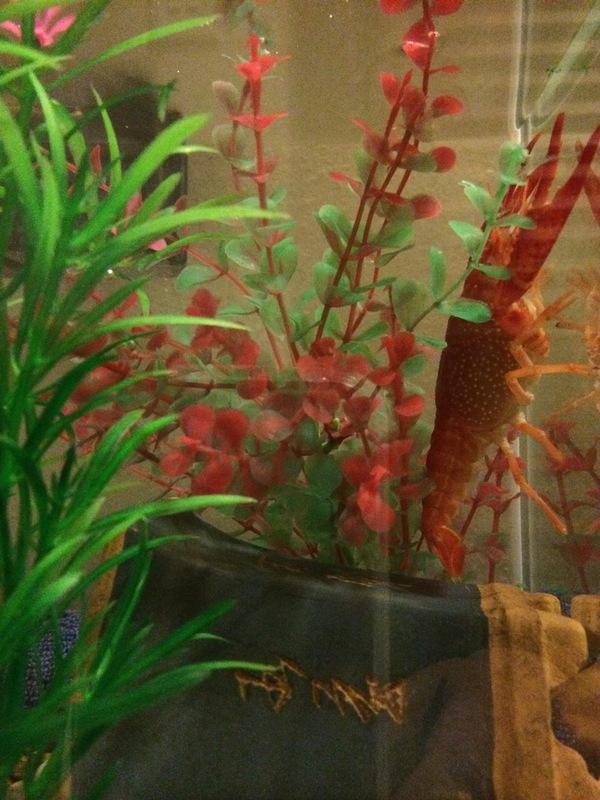 Crouching mantis, hidden prawn… Hehehe. It’s situations like these that remind me of my dinosaur status and how times have changed. Sigh… these days school-going teenagers are purposely skipping school especially after exams. Not so much to go out but to stay home instead. Yes, M2. When her big exam was over, according to her, there is no reason to go to school anymore! What?! I don’t even remember M1 doing this when she was still here. When I was a school-going teenager, skipping school was not even an option. No ifs, ands or buts about it as there was no negotiation with Mom and Dad whether I could give school a miss. And I don’t recall being sick qualified an absence. Also during the dinosaur era, there were no distractions like these days – the internet and smart phones, to want to skip school. Going to school was fun especially after the exams because I could be with all my friends to pass the time. We could talk or play all we want, do fun things or nothing, and not worry about studying or homework. We could even be silly and brave in front of even the most fierce teacher because we knew we would be forgiven when the school holidays kicked in. Aaahh… Those were the days. 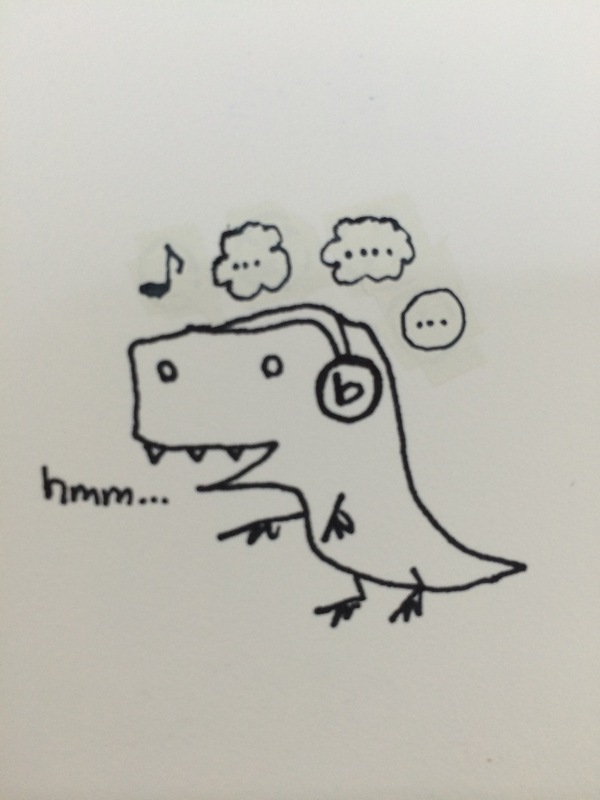 Innocent and carefree dinosaur days. These days? Going to school after the exams are no fun for M2 because according to her, none of her friends would go and she would be bored to death. She pointed out that there’s nothing to do, the friendliest teachers are always busy and there’s no one to talk to. Geez… making it sound as if she has been banished to no man’s land and is the only lonely surviving soul! So being at home is better because in this comfort zone, she and her friends are able to do Skype sessions with each other, hang out virtually to listen to music, watch a movie together or just talk the whole day! Unbelievable. Why can’t they just interact in person at school? I cannot understand them. With six weeks of holidays ahead, today being the last day of school and us busy with work, it looks like this pattern of activity will continue… unless we go away again for a family road trip or escapade… Hmm. I thought I would go back to golf soon especially after ceremoniously moving my gear to the BMW Golfsport cart bag. But with the weather being cloudy with a chance of rain every single day, I am still waiting for the opportunity. When will that be, I wonder? It seems to be a pattern that every time we are away on local escapades or road trips, there is this need to eat twice for breakfast. We did this in Ipoh two weeks ago and again in Penang on Saturday, the morning after the wedding dinner. For breakfast #1, we had an array of local delights: Char Kueh Teow, Lobak and some Kueh Chap innards minus the Kueh Chap at the coffee shop on Lebuh Carnarvon. Then we traversed to Jalan Gottlieb for the second breakfast of Assam Laksa. The coffee shop is located right smack opposite Penang Chinese Girls School. All these before noon, that’s why it’s two breakfasts. This pattern is only doable when there is no fixed agenda for the day. With a free and easy schedule and basically a mission to eat, the other adventure here is following the GPS to the coffee shops, then driving around to look for parking and thereafter, hope for an available table to reap the effort. I must admit I am not a breakfast person. My usual fare would be just a cup of coffee and something light. So having two breakfasts is worrying. The pants become subconsciously tighter than before and guilt sets in, so standing on my bathroom scale is a definite no-no for the time being. Guess there won’t be breakfast, let alone two breakfasts for now until the next road trip or escapade comes around! 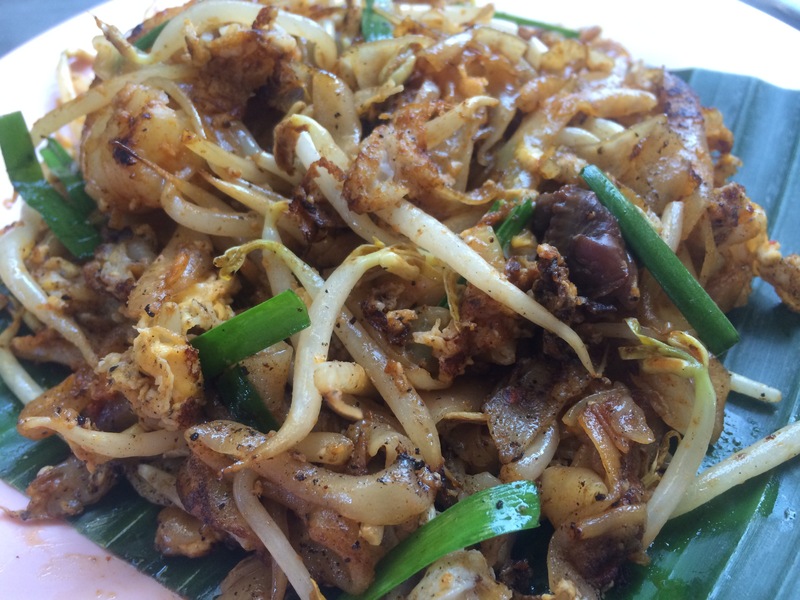 Char Kueh Teow with duck egg tastes better! We enjoy road trips every now and then. Four years ago, we went on our most epic road trip and what I called ‘The Great Adventure Road Trip‘. It was a 21-day trip that covered three states and a driving distance of 2,285 miles of the West Coast of the USA, flying distance not inclusive. We started off from Phoenix getting in from LAX with Southwest Airlines. From Phoenix, we picked up the keys to our rented MPV and headed off to Chandler, Flagstaff (to visit my college), the Grand Canyon, Henderson, Las Vegas, Anaheim, Long Beach, Los Angeles and San Francisco. It wasn’t so much to eat but rather to see old friends, places and do things; to share with my family places that I’ve experienced and to enjoy new sights together. Aahh… What an adventure we had and I would do it again if the opportunity came around. It sure is nice to reminisce and while we don’t do such lengthy road trips anymore, it is equally nice to go on one, albeit shorter. 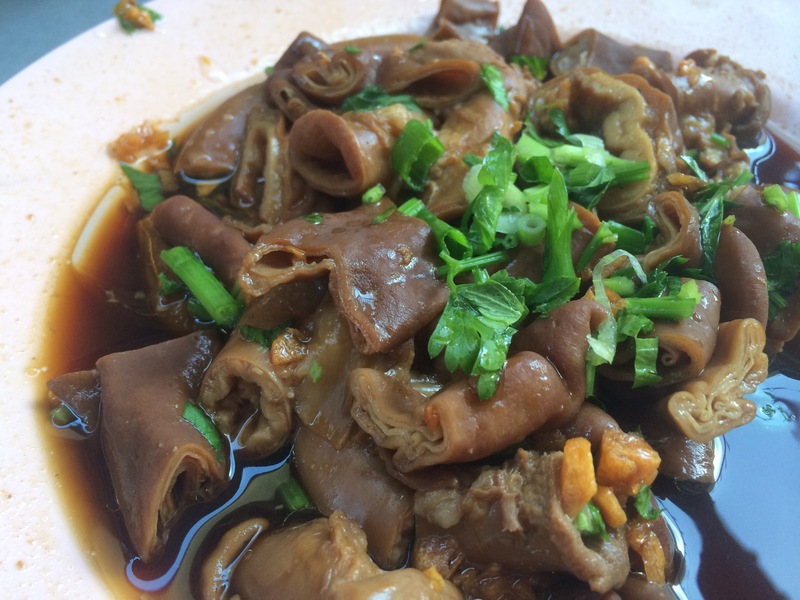 And of late, the short local trips taken focuses more on food. Over the weekend, we took a 3D/2N trip to Penang to attend a cousin’s wedding, skipping work and school on Friday. 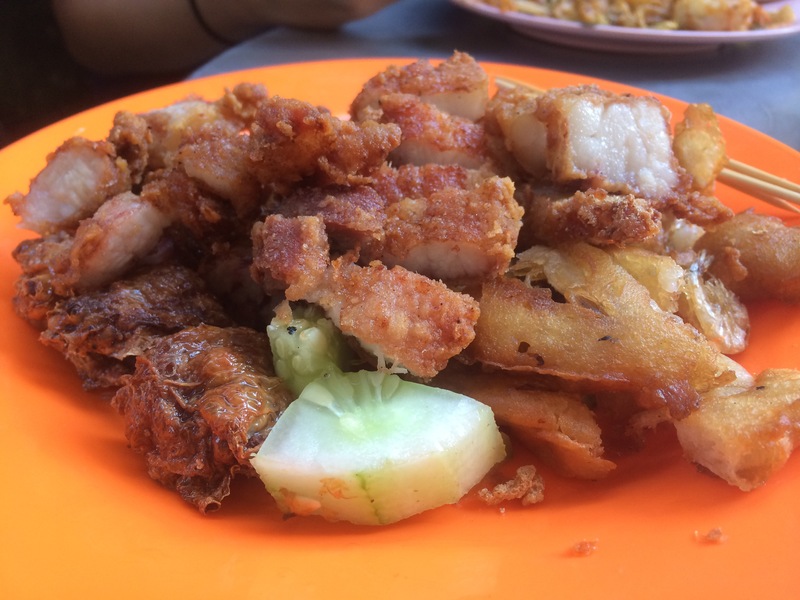 And while we were there, the local Penang food was top most on our mind. This gave us an opportunity to compare the flavors of Penang with Ipoh, which we visited two weeks ago. 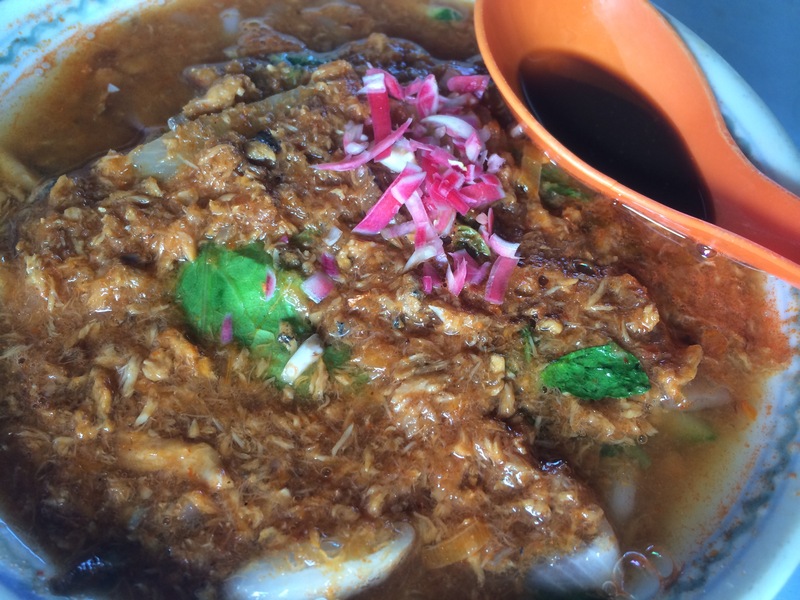 I must say there is a difference and conclude that the Char Kueh Teow, Lobak and Assam Laksa in Penang are simple mouth watering while the Loh Shi Fun and Chicken Rice with Beansprouts in Ipoh are tops. So be sure to have these items at the top of your checklist of must-eat before you try anything else.